Quadtec Solutions offers salary and benefit plans that are designed to meet you and your family’s financial goals, provide growth initiatives, and achieve a balance between your work and other components of your life that matter to you. As an employee, you are eligible for benefits according to your full-time/part-time status and the number of hours scheduled to work per week. Benefits vary depending on scheduled hours. How do we attract and retain top talent? Medical / Dental / Vision Insurance – We offer a top tier PPO medical, dental, and vision plan for employees through United Healthcare. The costs of these benefits are subsidized very generously by Quadtec assuring the employee premiums are competitively low. 401(k) Retirement Plan – Our 401(k) plan offers the opportunity to contribute up to the IRS maximum allowed per year. Several diverse funds are available. 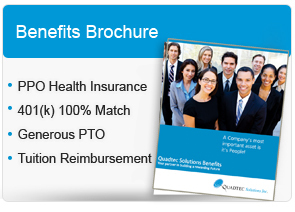 Quadtec matches 100% up to 6% of salary of 401(k) savings contributions to help our employees prepare for retirement. Short Term Disability Insurance – We offer excellent voluntary Quadtec group rate short term disability to help protect our employees with continued receipt of up to 60% of their salary during an unexpected qualifying situation preventing them from being able to work. Long Term Disability Insurance – We offer excellent voluntary Quadtec group rate long term disability to help protect our employees with continued receipt of up to 60% of their salary during an unexpected qualifying situation preventing them from being able to work. Life and Accidental Death & Disability Insurance – Our voluntary Life and AD & D Insurance is offered to our employees to protect them and their family. Quadtec group rates are very good and offer employees a $10,000 to $300,000 range for Life Insurance. Benefits Management Portal – We provide our employees a dedicated portal to reference and manage all six insurance benefits offered. This provides our employees fast, accurate, electronic access to the details of the plans that are so important to them and their families! Paid Time Off (PTO)– We offer three weeks of accrued PTO. Holidays – We offer 10 paid holidays per year for employees. For employees working in a staff augmentation role at a client, Quadtec will match the client’s holiday schedule with paid holidays. Family and Medical Leave (FMLA)– Should the need arise for time off for the birth or adoption of a child or for a serious health condition, you may take up to 12 weeks of unpaid family leave during any 12-month period. Salary – Quadtec recruits top talent and therefore pays its employees top salaries. Salaries are reviewed annually. Employee Referral Program – Refer qualified individuals to Quadtec and you may be eligible to receive cash for each referral we hire. Non-employees are also eligible to participate. Online Technical Training Subscriptions – Employees will be provided full unlimited access to an online training subscription that will provide employees with all necessary information and knowledge to obtain and maintain IT certifications to enhance their performance and advance their career. Flexible Work Schedules– Depending on the nature of the position, Quadtec provides flexible work schedules and work-from-home options.